Our same day denture repair service is second to none. Denture chips, cracks or breaks can be caused by daily wear and tear, age or the result of an unstable device. Have you sustained a denture breakage? Whether it’s a simple crack or broken teeth, a custom denture repair is required. In the case of a tooth extraction, additional teeth or clasp may be required. This too will need a denture adjustment. While our dentures are considered durable and sturdy, they do not respond well to being dropped onto hard surfaces. However, we understand things go wrong. With Dentures at Clayfield as your partner in denture care, you can rest assured your dentures will be repaired as soon as possible. These adjustments will be made from high-quality resilient materials to help prevent future accidents. We are able to offer emergency denture repairs in our on-site laboratory within the same day. It is extremely important to repair your dentures as soon as possible. To help you get back to living comfortably, we assess your needs and start on repairs immediately. How to repair broken dentures? Dentures at Clayfield strongly advise against attempting to repair your own denture at home. In our experience, super glue is not an alternative to a denture repair made in a dental laboratory. This is toxic and will cause further damage to your denture. Can chipped dentures be repaired? What does the repair process involve? The repair process will be dependent on each person’s unique requirements and initial assessment. Typically, an emergency repair service will involve taking an impression or mould of your damaged denture, adding a strengthener or prosthetic teeth. The final stage will involve curing the denture and polish. To request an appointment for same-day denture repair with Brisbane’s preferred denture clinic, contact us. 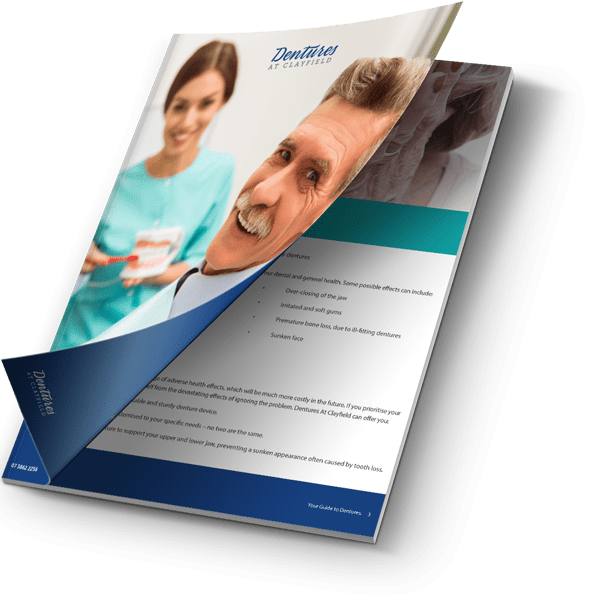 Get your comprehensive guide to dentures!